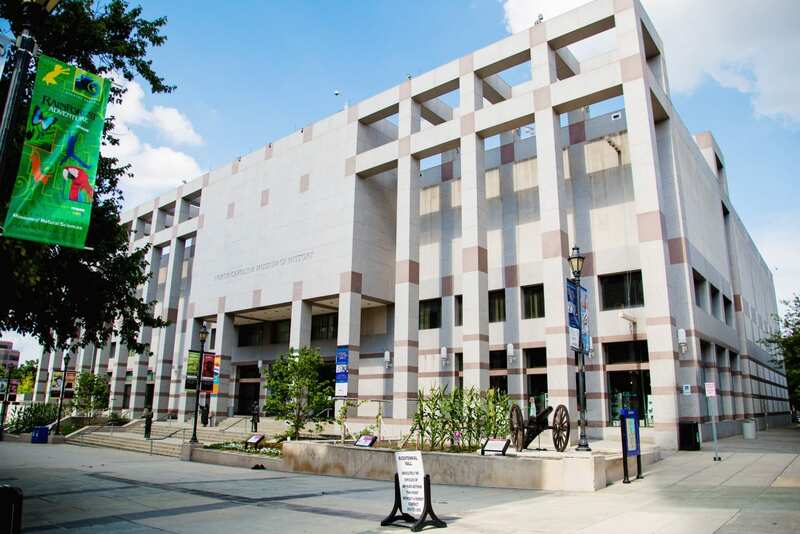 The North Carolina Museum of History is a modern venue in the heart of downtown Raleigh. Brides and grooms will love its sweeping staircase, shiny marble columns, friendly and professional staff, and its very own replica of the Wright Brothers’ plane. 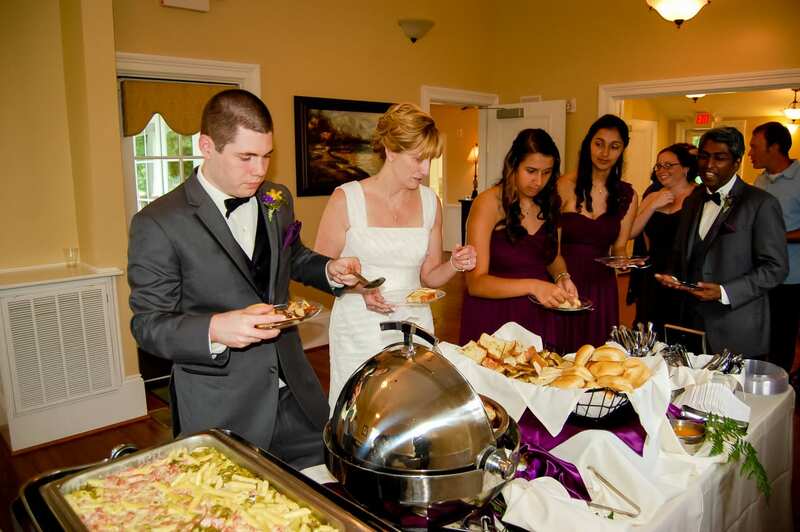 Catering by Design was honored to provide the Raleigh wedding catering for a recent bride and groom’s reception. We’re going to give you a taste of the highlights in this post. To see the entire gallery you’ll need to visit us on Pinterest. 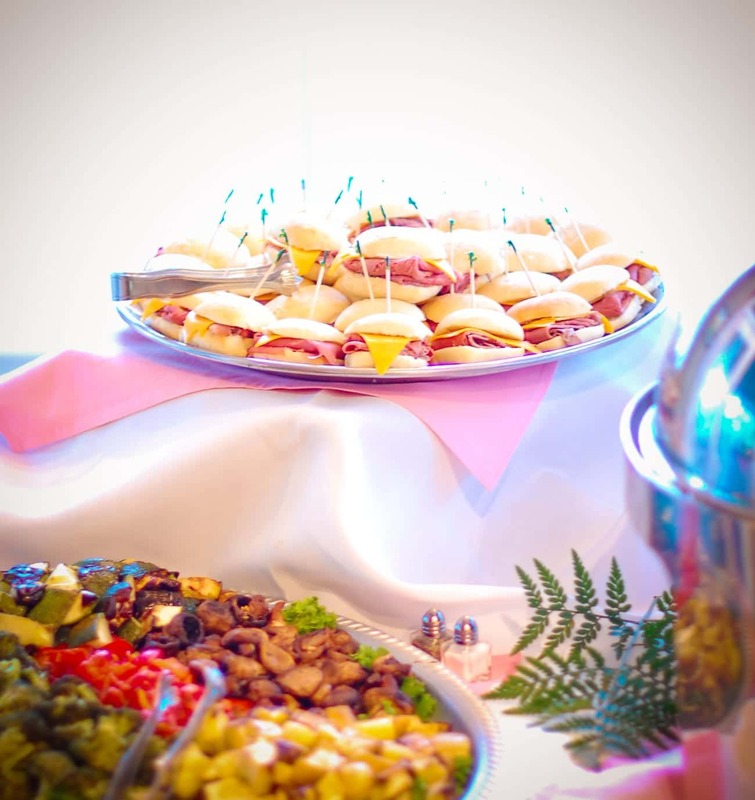 The stationary hors d’ oeuvres were served buffet style, a hot wedding trend for 2014. These featured a tasty tray of Imported and Domestic Cheeses with a Fresh Fruit Garnish and all types of Assorted Crackers. For the kids, and kids at heart, we had a wonderful selection of Parmesan Crusted Chicken Bites served with a sweet and spicy Apricot Mustard dipping sauce. The dinner buffet started off with a summer favorite; Baby Greens with Fresh Strawberries, Candied Walnuts, Feta Cheese and a refreshing Citrus Vinaigrette Dressing. Summers in the South are all about BBQ. Whether it’s BBQ pork, chicken or ribs … there is just something about that smokey flavor that keeps guests wanting more and more. 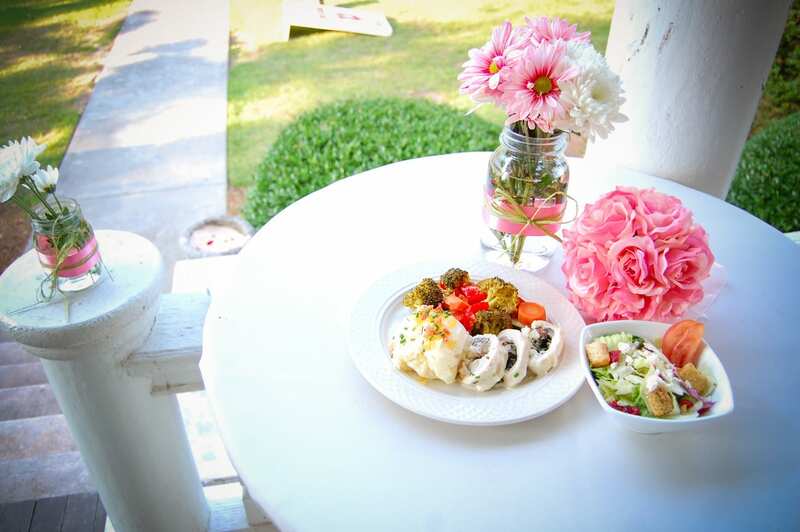 For this beautiful reception, the guests enjoyed several southern delights. We served BBQ Chicken and BBQ Ribs with Mashed Potatoes, Country Green Beans and a Creamy White Cheddar Macaroni & Cheese. Don’t worry, we didn’t forget the Cornbread either! Brides, when it’s time for your big day, we hope you consider Catering by Design. 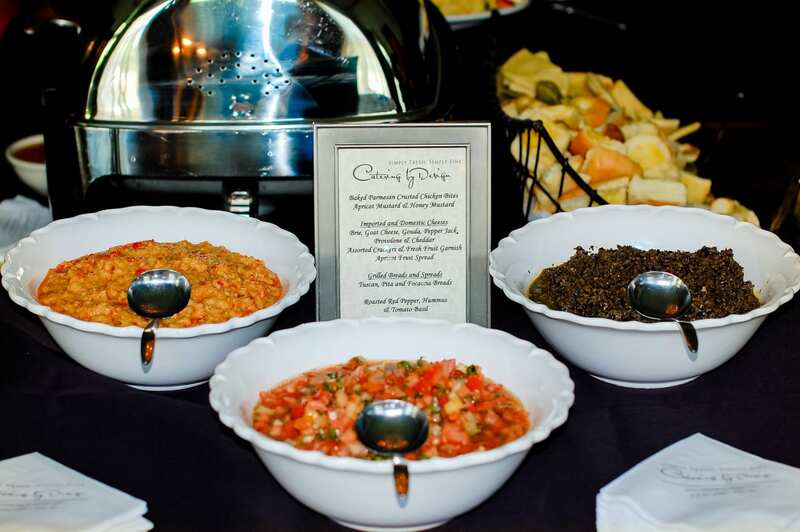 We have been serving the Triangle area for years and know exactly what it takes to make your Raleigh wedding catering an event to remember. We know you have several options to choose from; that’s why we offer free tastings whereas some of our competitors charge for this service. We let our food speak for itself, so come on in and let us win you over with service and flavors that you’ll remember forever. 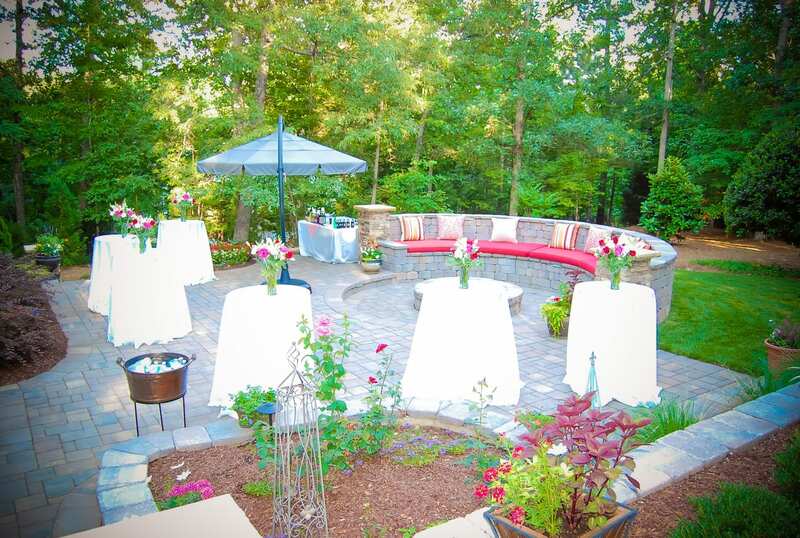 Regularly voted as one of the best wedding venues in The Triangle, the Rand-Bryan House offers brides a wide variety of wedding reception options for small, intimate gatherings to large parties! The Rand-Bryan House, a historic home nestled in the outskirts of Raleigh, was built in 1871 and restored to its original beauty using old-world craftsmanship and dazzling finishes. The house features beautifully restored interiors and porches surrounded by landscaped gardens and grounds. 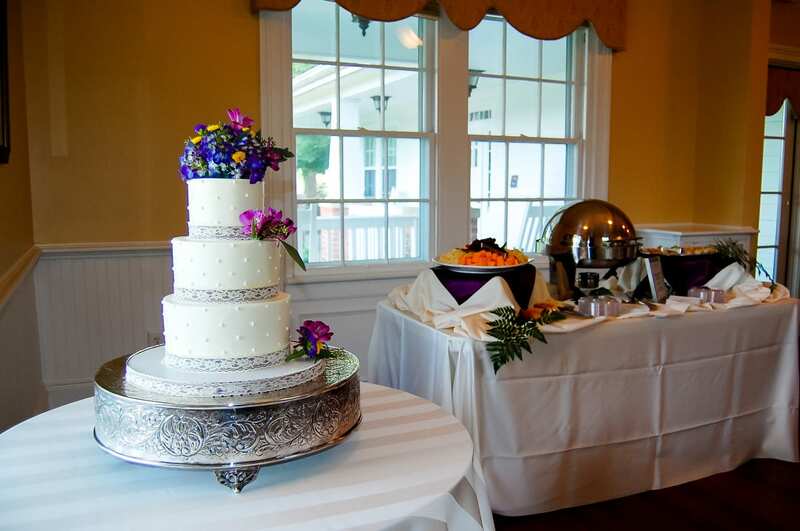 From wedding ceremonies and receptions to corporate and special events, The Rand-Bryan House offers a unique reception venue to fit any occasion. The rich, warm interiors, hardwood floors and neutral decor give guests the wonderful opportunity to personalize the colors and decorations according to their unique tastes. You can further customize your event by choosing a caterer, florist, event planner, photographer and other vendors to suit your wants and budget. 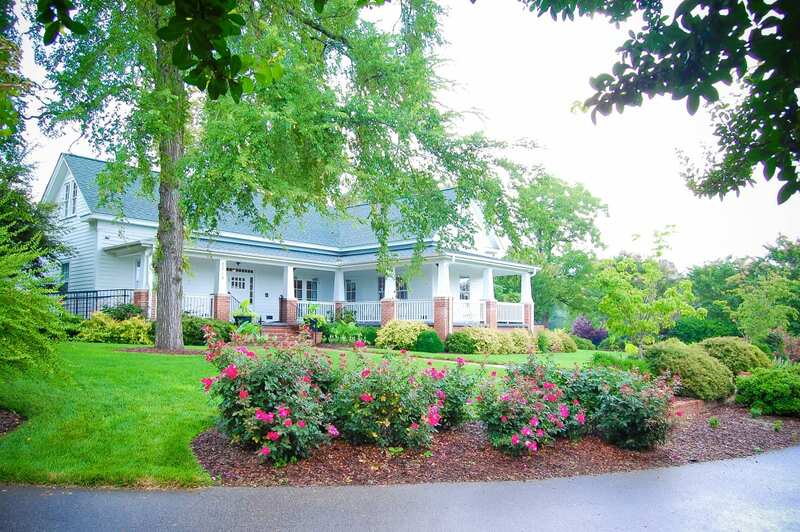 The Rand-Bryan House is ideal for brides in the Raleigh, Wake County and Johnston County areas seeking a convenient location to host their most special day. Your wedding guests will arrive to find a picturesque setting of evergreens and rolling pastures. Catering by Design was honored with providing the Garner wedding catering for a lovely couple this past weekend! We’re going to give you a taste of the highlights here but to view the entire wedding gallery, you’ll need to visit us on Pinterest. The hors d’ oeuvres buffet started off with Imported & Domestic Cheeses, Assorted Crackers with a Fresh Fruit Garnish, Spanikopita and our signature Toasted Phyllo Cups with Chicken, Mango & Cilantro Salad (featured below). The dinner buffet started out with the freshest Baby Greens with locally sourced Strawberries, Feta Cheese, Walnuts finished off in a Citrus Vinaigrette. 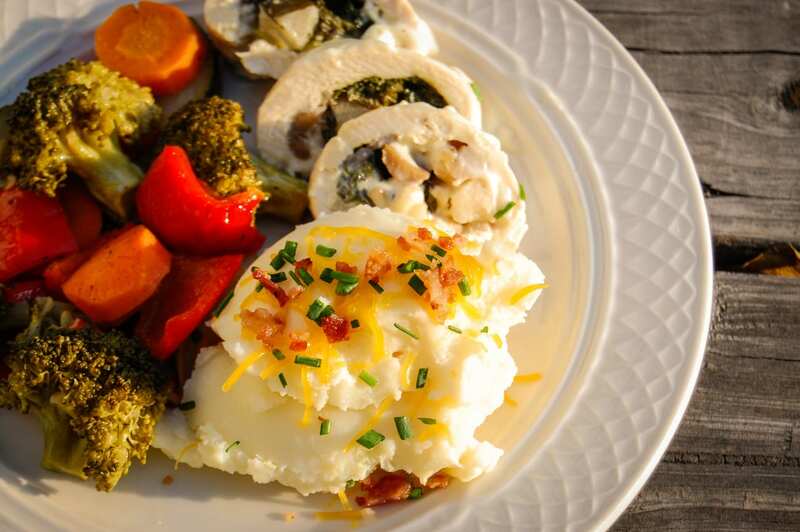 The star of the show was the incredible Stuffed Chicken Breast of Portobellos and Sun dried Tomatoes in a Creamy Vermont White Cheddar Sauce. The protein was paired with a delicious Penne Pasta dish that was tossed with Fresh Spinach and Red Peppers swimming in a Basil Cream Sauce, Rosemary Roasted Red Potatoes and a Sauteed Vegetable Medley. For dessert, the guests indulged in an interactive Ice Cream Bar with Vanilla & Chocolate Ice Cream served with Cherries, Sprinkles, Chocolate Syrup, Caramel Syrup and Whipped Cream. Even the old folks were feeling like kids when it was all said and done. For all your Garner wedding catering needs, please consider Catering by Design and our 30 years of experience in serving The Triangle. 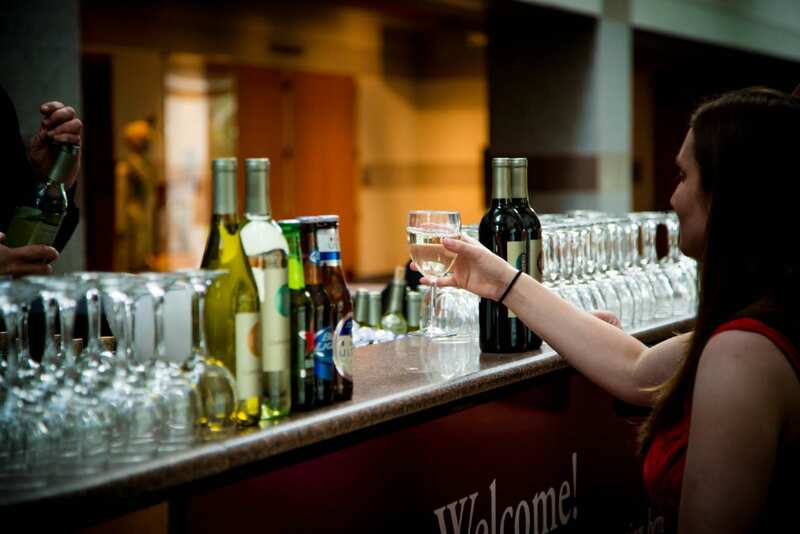 We’re a wedding wire award winning cater that offers free tastings to brides. Call us today or just stop by the kitchen. See ya soon! In part one of this series we touched on a few ideas as to why you should avoid taking on too many DIY wedding projects from Pinterest. In part two we’re going to cover the final three reasons why we think you should always choose a professional to handle the tough jobs. Let’s talk about wedding envy. Social media, in general, has been proven to trigger stress in people. Social media can make people envious of others. This holds true for Pinterest as well. If you have 3 million wedding pins you could start to feel like your wedding just isn’t good enough. Don’t let social media sites get you down in the dumps. Keep your pinning under control and this will help you avoid wedding day depression. It’s really hard to keep your wedding expectations under control when you have so many pretty options right under your finger tips. Sticking to your budget will help you keep your expectations under control, just don’t let Pinterest get the best of you. Say you have $15k to spend on your wedding. That image you just pinned from a David Tutera wedding is estimated to cost just $23k. But what you didn’t know was that was just for wedding flowers! What about that reception buffet made completely of ice? Swanky huh? Did you know you have to hire a sculptor to make it and that ice is extremely difficult to work with? That makes this item really expensive. One of the worst aspects of Pinterest is that brides can easily get hooked on things they love, but in reality … either have no idea about the cost or scope of the work required to achieve the look. This can be emotionally and financially draining. Stick to your budget and don’t go off the Pinterest deep end. Some people say the best form of flattery is imitation. Unfortunately, that doesn’t hold true for weddings. You know that goofy pose, that you just pinned, of the bridesmaids with the funny faces? More than likely, you and a thousand other brides are planning the same pose. Pinterest really does make it easy to be a follower and rather than an innovator. It’s really okay to seek out the hottest seasonal trends just be sure to keep your own personality mixed in with ceremony. Going Pinterest overboard will ruin the uniqueness of your big day. Work with your bridesmaids and groomsmen to come up with your own witty sayings and poses. Incorporating your ideas with the help of your loved ones will really make your big day, yours! 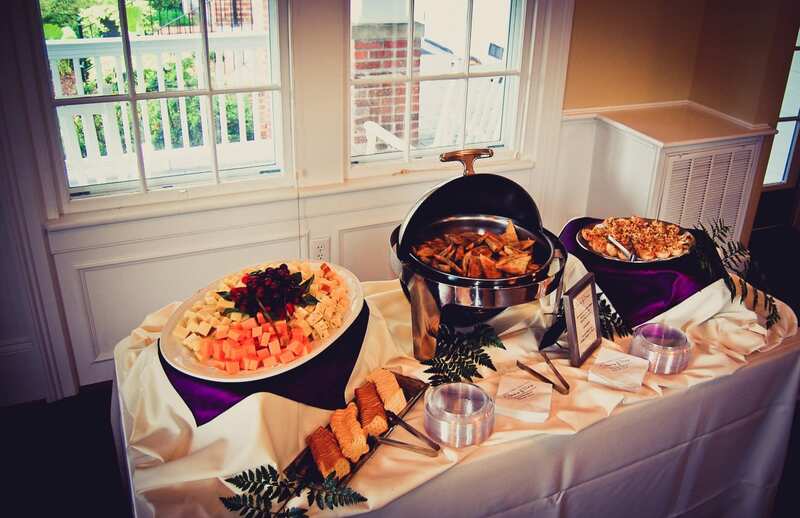 When planning your reception, we hope you will consider calling Catering by Design. We’re the experts for all your Apex wedding catering needs. 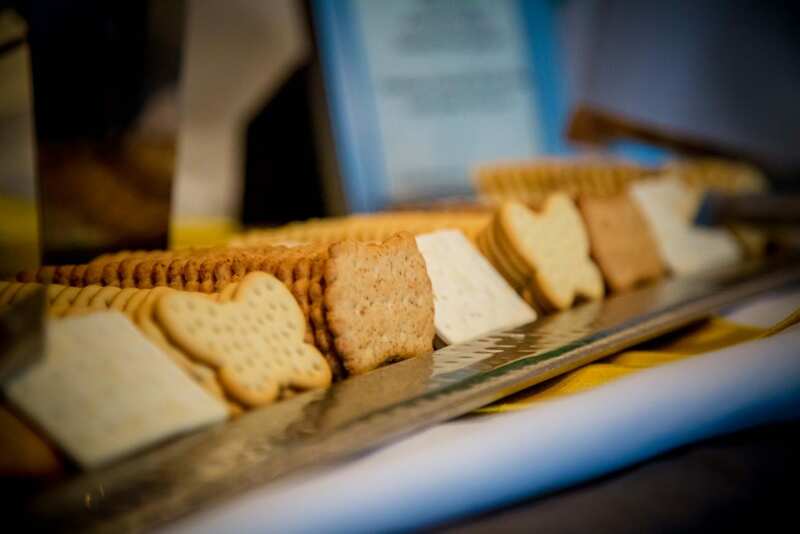 We have menus to fit any budget and offer free tastings to brides and grooms. Contact us today! I often wonder what my wedding, and all my friend’s weddings, would have been like if Pinterest existed back then. I’ll admit it; I love the famous DIY website even though it can seem a little overwhelming at times. I’m sure I would have spent hours of my time pouring over wedding boards and updating my pins every chance I had. As it stands now, I attempt arts and crafts from my favorite pins all the time. Regardless, I’m glad it wasn’t around then and I didn’t have that option because as it turns out, Pinterest can actually be a huge source of stress and confusion for many brides. I know you probably don’t believe me but give me a chance to explain myself before just writing this off. 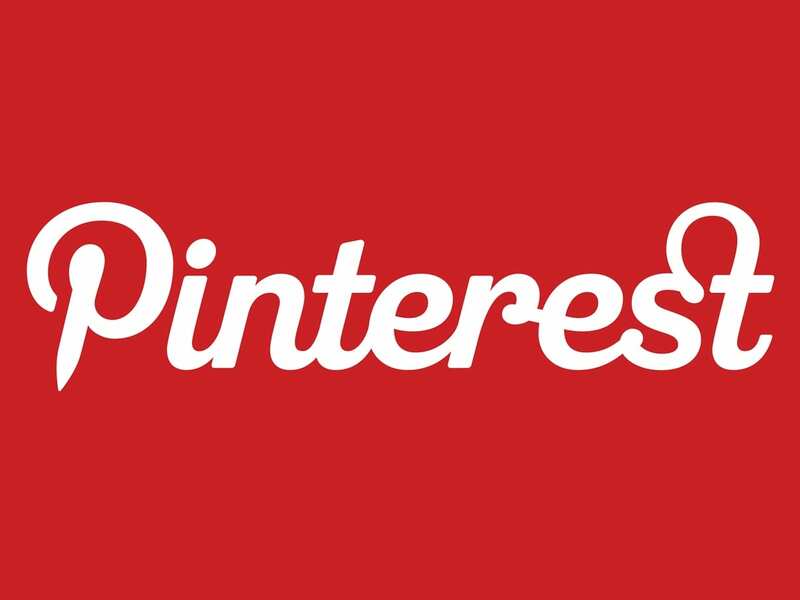 In this miniseries we’re going to touch on five reasons for controlling your Pinterest urges. These points might not apply to you but may be appropriate for a soon-to-be bride you know. Share these tips with her so she can get her pinning tendencies under control. Here are my first two reasons why you should proceed with caution with planning a Pinterest wedding. You actually can have too much inspiration. Too much inspiration can be overwhelming and confusing. Think about it … how long do you actually spend on each picture before pinning it? If you’re like the most us, you probably spend only a few seconds before pulling the trigger. In just a 30 minute Pinterest session, you could have around 360 pins, or ideas, that you’ve fallen in love with. This mess of ideas can cloud your original vision and make you indecisive. This is really not a good way to spend your time planning your wedding. After all, time is money. Also, don’t let too many opinions blur your own vision. Too much pinning and you will get sidetracked! If you’re like me, you have a DIY board that you’re constantly pinning to. I just get so inspired. One day I’m trying to be a plumber, the next day I’m practically Martha Stewart or playing carpenter. The beauty of Pinterest is that it allows us to dream and try all types of new DIY projects in our own homes. I have all these projects, pinned to my board, and I have no general skills to really do any of them. I pinned them because the pictures and tutorials make it look so easy. Every one of them claims to be cheaper than hiring a pro to do it. In reality, I would probably burn my house down if I really tried to accomplish all of these DIY projects. I think you see where I’m going with this series of posts. You should really leave most things to the professionals. That’s their job. Having professionals handle the most important details for the most important day of your life is not a bad idea. When you’re ready to plan your big day, make sure to call Catering by Design for all of your Apex wedding catering needs. We’ve been proudly serving the Triangle for over 30 years. Ask us today about our free menu tastings and china offers. Life is filled with special events that should be celebrated with food and fun. Anniversaries, Birthdays, Family Reunions, and especially Graduation Celebrations are truly memorable events in one’s life. Catering By Design is proud to have been involved with many of these events and we vow to bring our experience, expertise and understanding to your special occasion. 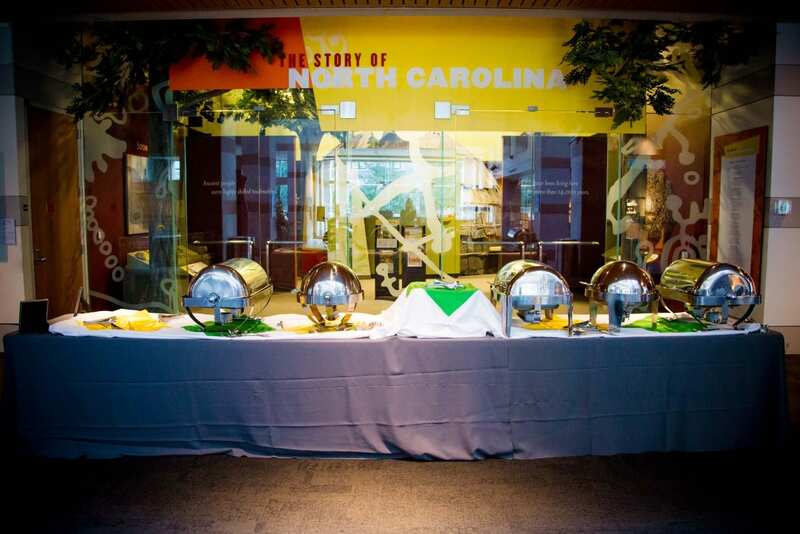 We provide the best social event catering in Raleigh, NC and the surrounding areas. We recently had a great time catering a graduation party close to Cary, NC. 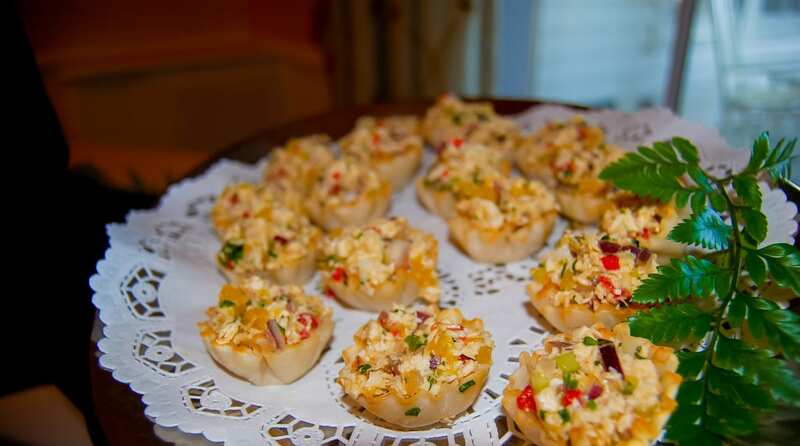 Guests were able to enjoy a variety of miniature finger foods, a hot 2014 wedding trend and great idea for summer weddings in North Carolina. In the kitchen, we served Seasonal Fresh Fruit Kebobs paired with a Sweet Yogurt Sauce and a tasty Antipasto Platter of Italian Meats, Cheeses, and Marinated Grilled Vegetables all Served with Assorted Breads. The breakfast nook was set up with a wonderful array of medium to heavy hors d’oeuvres. We had Chilled Marinated Grilled Vegetables, Penne Pasta tossed with Portobellos and Roasted Peppers in a yummy Basil Cream Sauce, and miniature sandwiches as far as the eye could see. Assorted Sandwiches of Carved Ham with Whole Grain Mustard Sauce and Carved Turkey with Cranberry Aioli were served on Sweet Potato Rolls. The Carved Roast Beef sandwiches had Cheddar and a Horseradish Cream on Soft White Rolls. Outside, the screened in porch featured the heavies. Our signature Miniature Crab Cakes with Lemon Aioli; the Spring Rolls were paired with a Sesame Ginger Dipping Sauce and everyone loved the Baked Parmesan Crusted Chicken Bites with the Apricot Mustard Dipping sauce. It was a hot, summer North Carolina Saturday and the beverages were refreshing … needless to say. The party was a hit and everyone left the event full from all the wonderful food and fun! To see the entire gallery, check us out on Pinterest! For the best social event catering in Raleigh, and the surrounding areas, give us a try. We’re an award winning cater with over 30 years of experience. Call us, or just stop by our kitchen. We’d love the opportunity to serve your family. Want to find a great-tasting way to incorporate your country heritage into your big day? How about having a barbecue? Barbecues are a fantastic option for brides and grooms that want to have a reception meal that tastes as good as it looks but is more budget friendly! 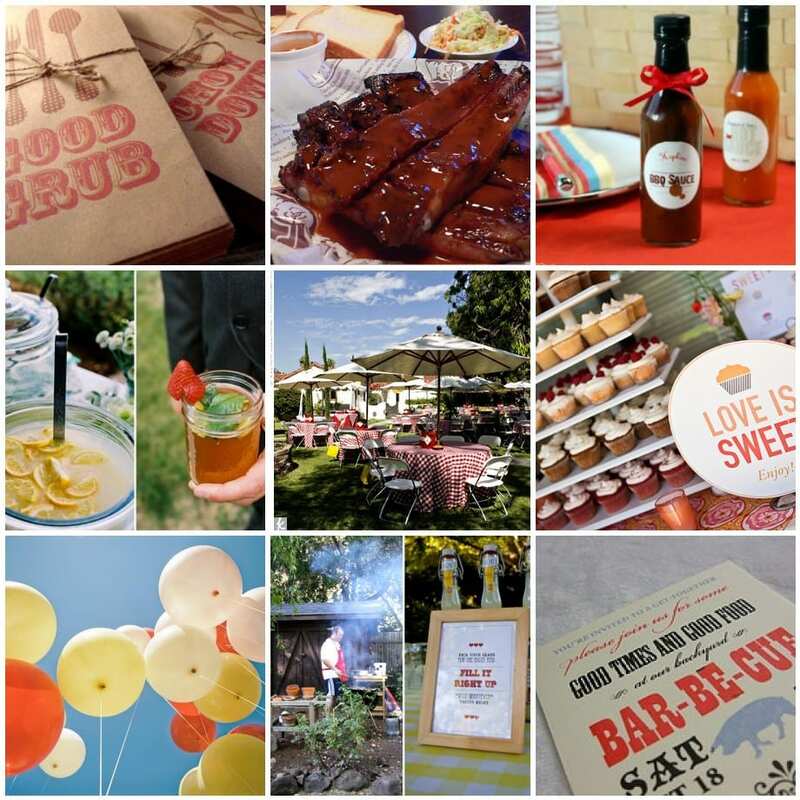 We’ve put together three tempting reasons that might sway you towards using a delicious barbecue for your Chapel Hill wedding catering. Wedding expenses add up really quickly. 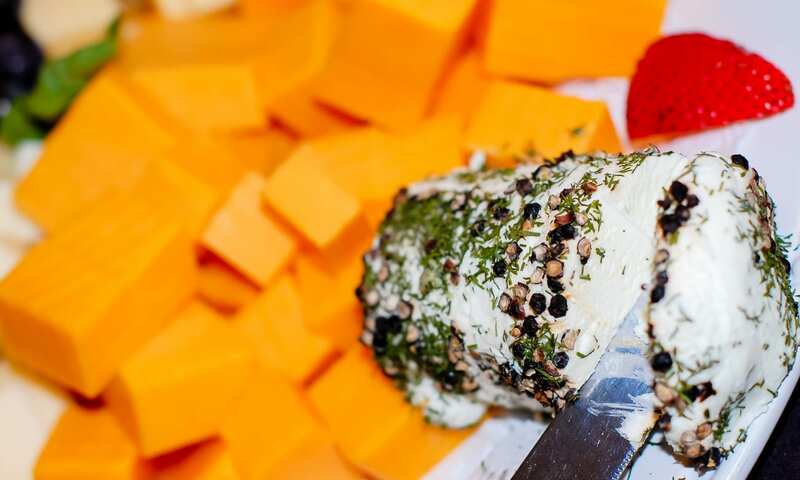 By choosing the right Chapel Hill wedding catering food and vendor, your budget can be stretched to make sure you’re not breaking the bank. Depending on your values as a bride, you might want to splurge part of your budget on a name brand gown or say your vows in that elegant mansion on the hill. Because of this, your Chapel Hill wedding catering may not be at the top of your budget. Having a barbecue might be your best option as these food options are more commonly found and are easier to cook than other catering options. 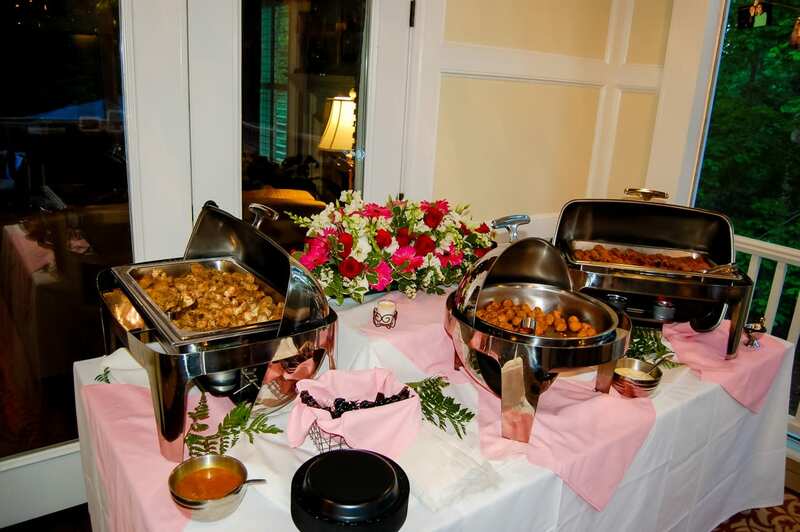 If you’re a bride that’s looking to save money, then consider using a barbecue for your Chapel Hill wedding catering. It can be the perfect solution for having a tasty meal at a great price. You don’t have to have been born in the South to enjoy great tasting southern food. But, it’s no secret that the southern states have a certain flair when it comes to barbecue. Country themed weddings and receptions are becoming more and more popular in all states but have always been popular for brides in North Carolina. Every bride loves being able to tie in their heritage in any way possible and barbecues are great for showing off your country chic ways. Your wedding guests are really looking forward to the reception meal and party. Part of the fun includes planning the menu and how the food will be served. 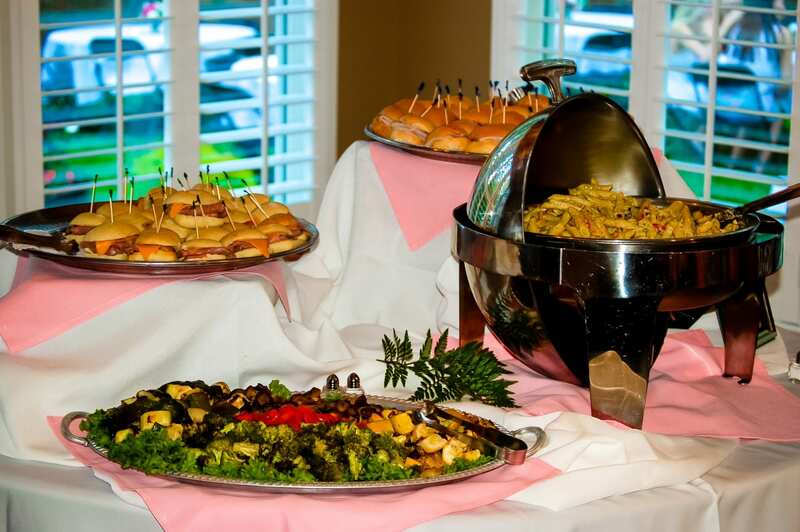 You want to make sure the guests have fun the entire night and having the right Chapel Hill wedding catering food should be at the top of your list. If you want to make sure all your guests will enjoy the food then serving traditional North Carolina barbecue food options will fit the bill. In the south, barbecue is a comfort food. It’s a meal most, if not all, of your wedding guests will love. Don’t worry about a barbecue being too informal. The best caterers, like Catering by Design, will work with you to make sure your reception meal goes off without a hitch. We do more than just cook food. 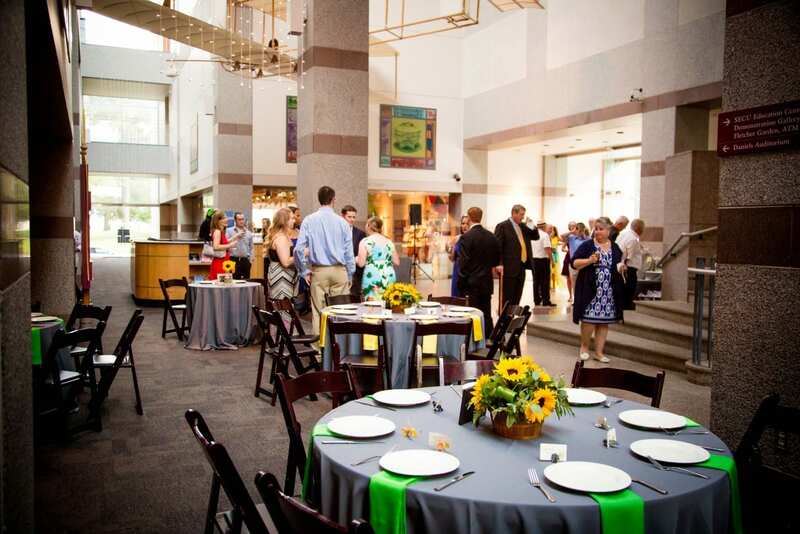 Our staff can help you plan your entire Chapel Hill wedding catering needs. Call us today and ask about our free menu tastings and free china offers. It’s finally time for your wedding weekend and your big day. All the time and effort you’ve put into planning every single small detail, from the venue to the food has come to this moment. You’ve stressed enough. One detail that you shouldn’t stress about is your rehearsal dinner and venue. We suggest that the bride and groom first try and figure out what type of food they would like to have at their rehearsal dinner. Then, decide how you would like for it to be served. Finally, establish a budget and stick with it. Once you have these few things figured out you can start creating your list of doable options. 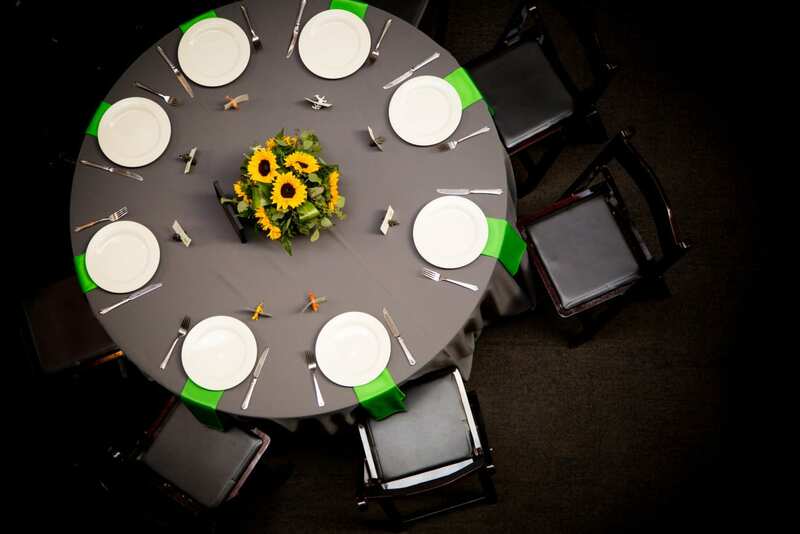 Most rehearsal dinner venues offer different prices for different numbers of people. Since you should have a good idea of the number of people coming to the dinner this will help you trim your venue list even further. Whether you want a casual cocktail reception or a formal seated rehearsal dinner, sticking to your budget will make sure you get the type of dinner you’d like to have. If your budget allows, really think about having a day-of coordinator. Some rehearsal dinner venues offer this in their packages while others will charge for this service. Regardless, a coordinator can greatly reduce the stress by setting everything up before the rehearsal happens. Most brides will tell you that having an on-site/wedding coordinator is invaluable. They are able to work with you and your wedding vendors in every step of the planning process. If you are not able to afford a wedding coordinator, make sure to ask your rehearsal dinner venue if one is offered with your package. Make sure to always inspect your venue before booking it. 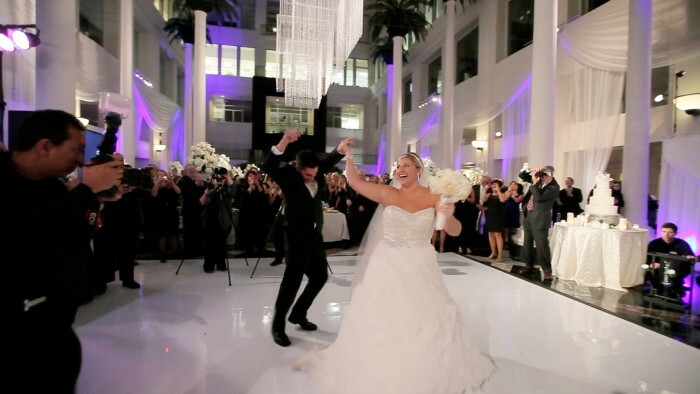 Make a list of all the must haves your venue should have and check them off as you visit. 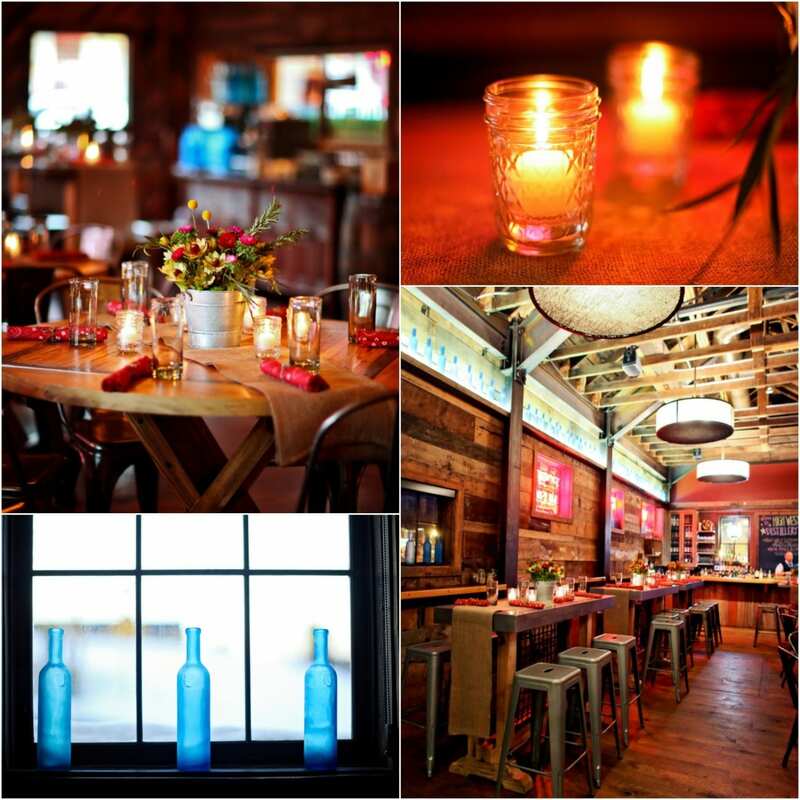 You want to ensure your rehearsal dinner venue is equipped with the proper tools making it a stress free event. Many venues already offer free WiFi and A/V hookups in case you need to use electronics so you shouldn’t have to worry about being charged for this. You will also want to make the venue staff aware of all your evening plans. This will help them prepare for your last night as a Miss. 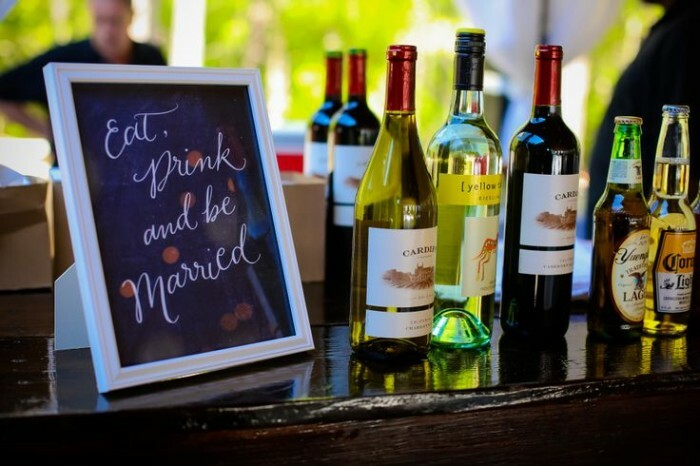 Catering by Design, your go-to Cary wedding catering company is here to help all brides complete their journey into marriage. We’re a Wedding Wire Award Winning Caterer three years running – 2012, 13 and 14. Call us today and let us help you plan your wedding weekend. The Howard House is a historical colonial revival mansion that’s nestled in the historic district of Dunn, NC. Anyone who passes through the front doors of The Howard House will immediately admire the architectural beauty of this 100 year old mansion. This venue is the perfect location for every bride’s wedding. The mansion’s grounds are just right for a summertime NC wedding catering event especially when the weather is this perfect. We recently had the pleasure, and honor, of catering a beautiful summer wedding here and put together the highlights for your enjoyment. We’ve peppered this post with some of our favorite food pictures but if you want to check out the entire gallery, visit us on Pinterest. 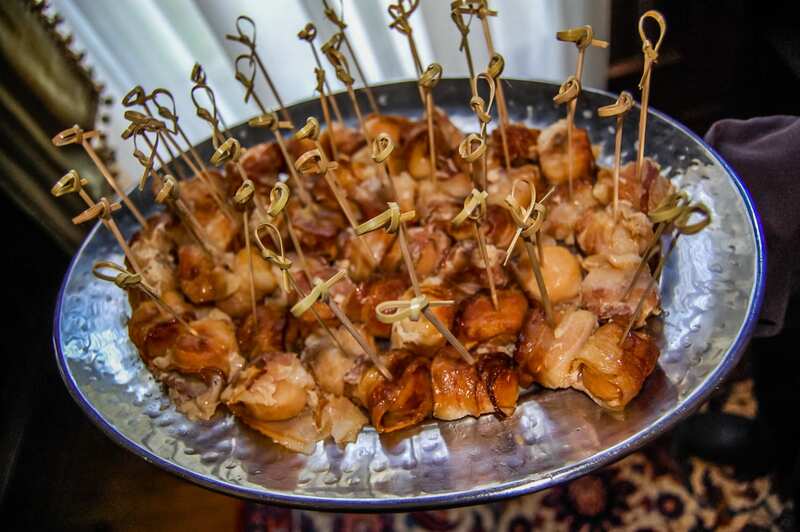 Wedding guests were started off with two great tasting Butlered Hors d’ Oeuvres – Above we have our savory Bacon Wrapped Scallops and below we feature Beef Wrapped Portobellos in a Sesame Ginger Glaze. The bride and groom selected a plethora of Stationary Hors d’ Oeuvres. Here we have a beautiful tray of Imported and Domestic Cheeses. Brie, Goat Cheese, Gouda, Pepper Jack Cheese, Provolone and Cheddar were paired with Crackers, Fresh Fruits and a yummy Apricot Spread. The Grilled Tuscan, Pita and Focaccia Breads were supplied by Neomonde Bakery. They were served with 3 amazing spreads – Roasted Red Pepper Humus, Olivada and a Tomato Basil Salsa. Anchoring the Hors d’ Oeuvres Buffet Stations we served up a tasty treat for the little ones – Gourmet Styled Baked Parmesan Crusted Chicken Bites with Apricot Mustard & Honey Mustard dipping sauces. 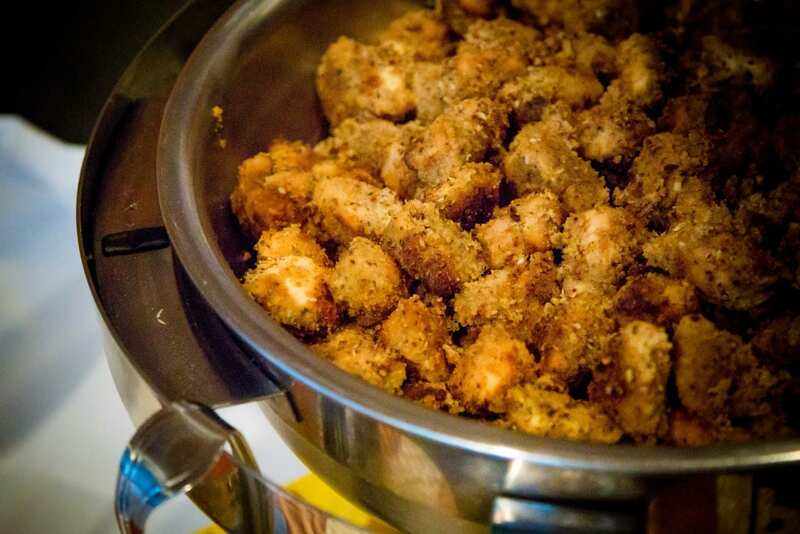 These fancy chicken nuggets were disappearing quicker than we could make them. 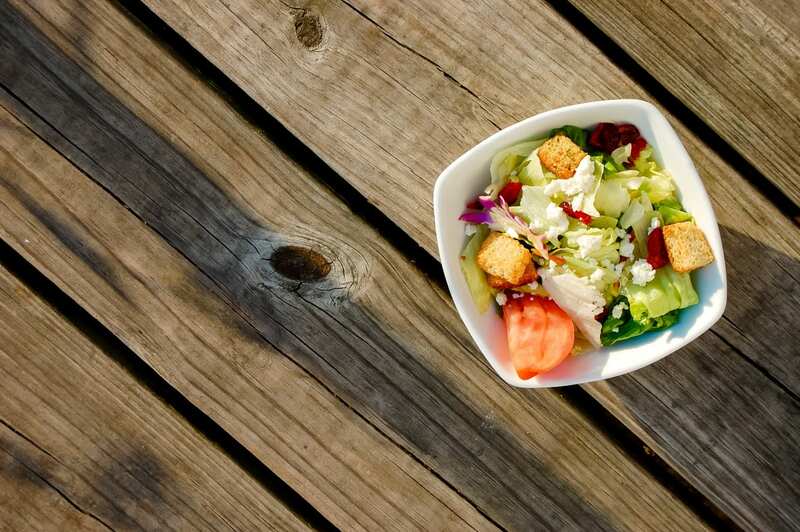 The NC wedding catering buffet started everyone off with Seasonal Greens topped with Cranberries, Walnuts, Feta Cheese, Tomatoes, and Croutons. 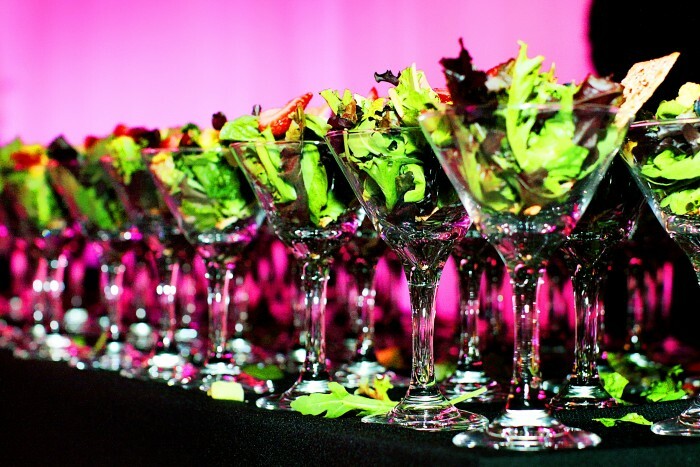 Guests were able to finish their salads with their choice of either a House Vinaigrette or Raspberry Vinaigrette dressing. An interactive Mashed Potato Bar was a hit with both the kids and the adults. Toppings included Bacon, Sour Cream, Chives, Butter and Cheddar Cheese. And for the health conscious guests, we served a succulent Vegetable Medley Sauté. The main entree featured a Chicken Breast Stuffed with Spinach, Mushrooms, and Diced Granny Smith Apples. Covered in a Smoked Gouda and Roasted Garlic Cream Sauce, this dish kept guests coming back for seconds. Carving Stations are always a big hit, especially if you’re using a buffet instead of a formal dinner. Featured here is a Rosemary Roasted, Top Round of Beef served with Au Jus, a Spicy Horseradish Sauce, Whole Grain Mustard Sauce, & Balsamic Onion Marmalade. Assorted Fresh Rolls and Grilled Breads were used to make mini sliders. 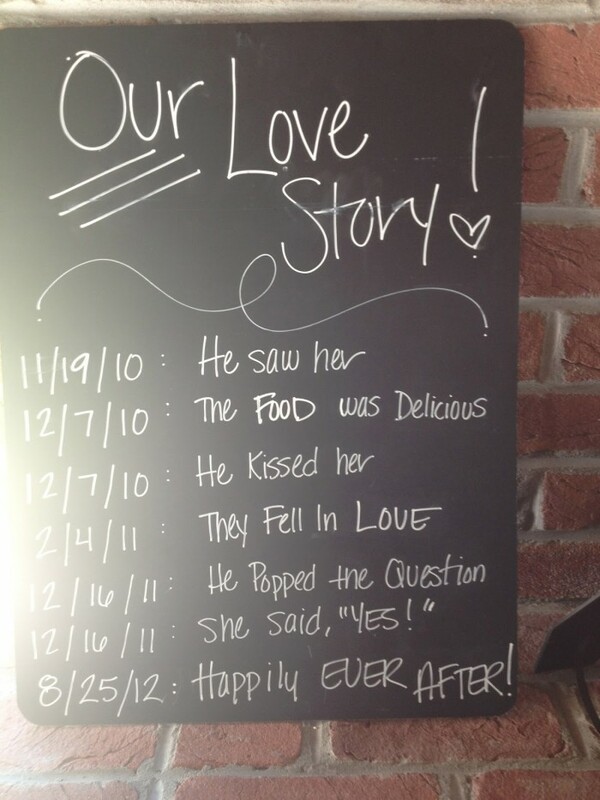 In the end, it was a beautiful wedding full of love, fun and flavors. 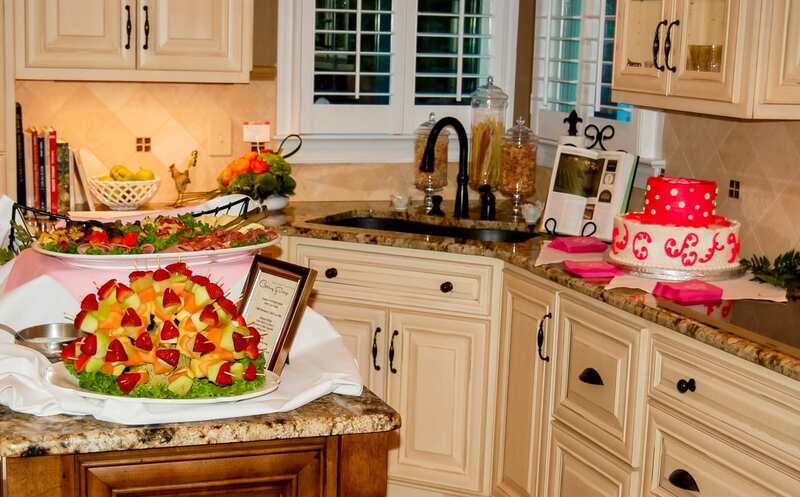 If you’re in need of an outstanding NC wedding catering company, give Catering by Design a try. We offer free menu tastings whereas many of our competitors charge for this service. Not only do we serve food but we serve you like you’re a member of our very own family. Call us today or just come by our kitchen. One thing every bride can count on when planning her Durham wedding catering is that guests love a good meal. Truth be told, most guests look forward to the wedding meal more than any other part. Whether you’re serving elegant and unique hors d’oeuvres, a traditional sit down dinner, or having a southern style buffet, people love to experience things they don’t get every day. Once you’ve selected your caterer, sit down with the chef and share your vision and menu ideas. Make sure to incorporate the chef’s recommendations, as they’re the professionals here, but a mixture to suit everyone’s tastes should be an easy compromise. You can create a unique dining experience for your friends and family no matter what style wedding and reception you are having. So don’t worry about how adventurous your guests are, or aren’t, as these tips will help you have fun with planning your big day. Normal, nightly dinners compared to the meal you eat at a wedding reception differ in the meal experience you create. Your wedding reception catering should be a combination of entertainment and extraordinary food to create a night full of wonderful memories. Show your wedding guests something different by using unique menu offerings, creative presentations and interactive food stations. Don’t be nervous about serving something out of the box. Guests might be hesitant at first, but by the end of the evening they usually end up loving the new experience. Be aware that some of your guests probably attend a lot of weddings. After a while they can all seem the same. If you want to be the talk of the town then make sure to read up on all the new trends for your wedding season and incorporate them. You can even make your reception more personalized by including a sweet story about how your menu items, or décor, mean something special to you and your groom. To have a reception that’s outside the norm you don’t have go crazy. Durham Wedding Catering Tip: Choose something out of the ordinary by putting a modern and creative spin on a traditional dish or creating a miniature version of a classic. The goal is for your food to keep your guests talking for not days, but for weeks and months after your wedding. If you’re going to have an adventurous wedding reception, make sure to have a few safer offerings for guests that are more reserved. Start with a few items that you know you cannot go wrong with. 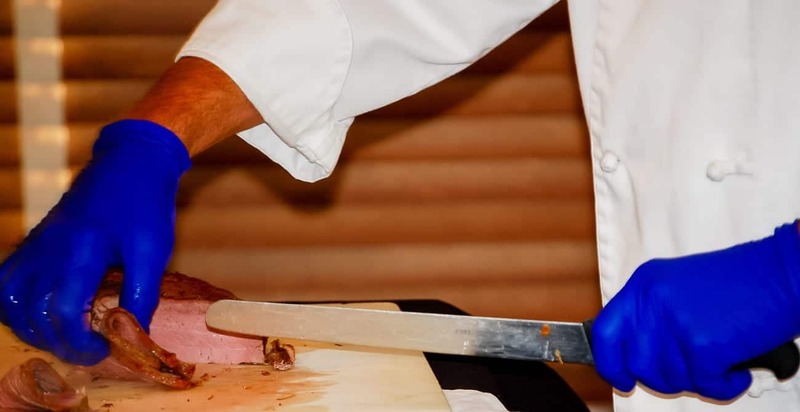 Even with safer menu items, like traditional carving stations, you can still put a modern twist on them by making them more interactive by combining it with a way to create your own sliders. Brides, do you want to have a large, extravagant celebration to commemorate your marriage? You probably get excited just thinking about seeing all your childhood and college friends, family that you don’t see often, and all the people that make your life special. With all the guests attending your big day, you might feel intimidated when planning your fall wedding reception catering. Don’t worry, we have a few tips to keep your stress levels low and your reception magnificent. When planning a fall wedding reception, there are a ton of variables to account for. With so many vendors, you can run into communication problems which will cause major headaches. You should be able to find a wedding reception catering company that does more than just cook the food. By limiting the number of vendors involved in your reception, you lower the possibility of communication issues drastically. With big wedding receptions, you really should keep the number of vendors down to a minimum. You’re going to need more of the necessities, such as food, flowers, decor, china, etc. so go with a wedding reception catering company like Catering by Design. We offer brides and their family help with all their event planning needs. Contact us today to learn more about all of our services. Wedding Reception Catering Tips: If your budget allows, hire an onsite wedding coordinator. They’re extremely helpful with keeping all of your vendors on the same page. With a bigger reception, you’ll probably have a larger variety of food and guests with vast preferences and tastes. 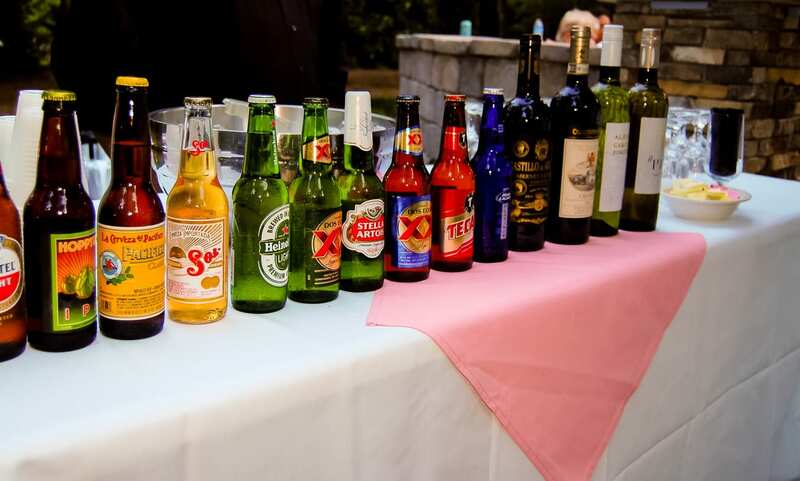 Because of this, you’ll need to make sure your wedding reception catering company is extremely knowledgeable about the ingredients used in the food as well what is being served as beverages. Your caterer will need to label everything at the wedding. This will ensure no one gets confused about what they’re eating or drinking. This is a key factor in making sure the reception goes smoothly. This is especially wise if you’re having vegetarians, gluten-free diets and guests that are sensitive, or allergic, to other particular ingredients. It’s no mystery that with a larger reception comes larger financial responsibilities. This will cause any bride to stress out about her budget. Some brides will even turn to Pinterest for DIY ideas to save space on their budget for other, more seemingly important items. Seems easy right? A big DIY wedding project can actually cause even greater stress for your wedding. Most people think they’re a lot more creative and capable than they actually are and this can leave brides with too much to do with not enough time. Think about a bride trying to create all the centerpieces for her reception tables. Should be easy with all the resources on the internet and willing bridesmaids, right? Often this is not the case. Without being a professional, it’s hard to understand the scope and scale of a project like this. Two weeks before the wedding, you’ll find an even more stressed out bride with only a quarter of the centerpieces finished and a million other things that have to be done. This is easily avoidable by limiting your DIY ambitions. 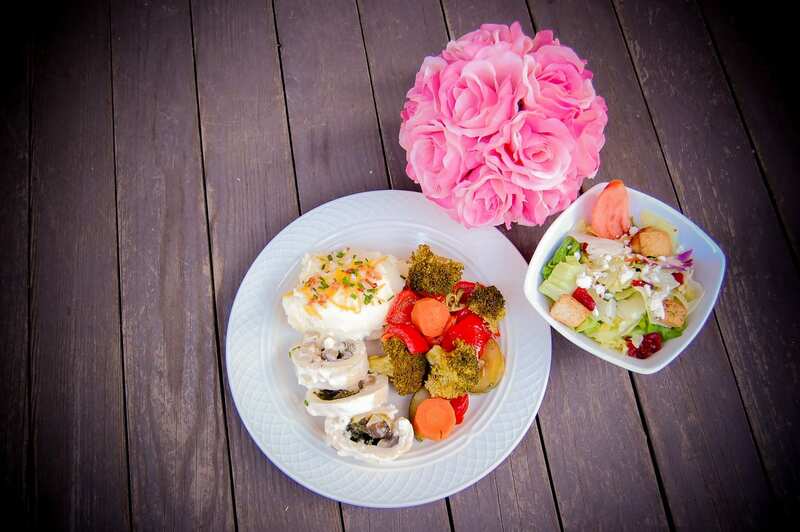 When you’re ready to plan your wedding reception catering, please consider Catering by Design. We’re a Wedding Wire Award Winning Catering Company three years in a row – 2012, 2013 and 2014. Ask us about our Free Menu Tastings and Free China Offers!